Collins has inked a six-year, $84 million deal with Washington, Ian Rapoport of NFL Network reports. Analysis: Collins' market-setting contract will reportedly include $45 million guaranteed, to be paid out over the first three years of his new deal. The 25-year-old safety is coming off a 2018 season in which he logged 96 tackles in 12 games for the Giants. As long as Collins stays healthy, the 2015 second-rounder should remain a quality IDP in his new locale. The Giants have informed Collins (shoulder) he won't receive a franchise tag, Jordan Raanan of ESPN.com reports. Analysis: The team technically can still sign Collins to a long-term contract, but this decision suggests he's as good as gone, making him one of the top players available in free agency when the new league year begins March 13. Collins should make a full recovery from Dec. 11 labrum surgery before the start of training camp. The Giants likely won't use the franchise tag on Collins (shoulder), Ian Rapoport and Kimberley Jones of NFL Network report. Analysis: The Giants have approximately $27 million in cap space to work with this offseason, but it appears the front office isn't willing to devote the amount needed ($11.15 million) by placing the aforementioned tag on the safety. Such a decision will be made by 4 p.m. 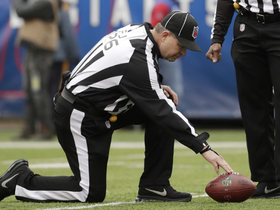 ET on Tuesday, at which point Collins will be available when free agency kicks off March 13. In four pro campaigns, he's averaged 7.4 tackles per game, which prorates to 119 across a 16-game slate. 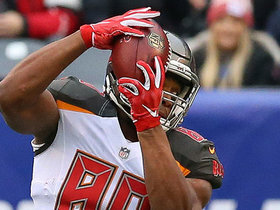 Collins (shoulder) is a strong candidate for the franchise tag, ESPN.com's Jordan Raanan reports. Collins (shoulder) won't play in the Jan. 27 Pro Bowl, Mark Inabinett of AL.com reports. Analysis: Collins is presumably still on the mend from December shoulder surgery to repair a torn labrum in his left arm. His spot will be filled by Eagles safety Malcolm Jenkins. Collins (shoulder) said Tuesday he would be willing to play under the franchise tag if necessary, Jordan Raanan of ESPN.com reports. Analysis: Collins missed the final four games of the season after undergoing shoulder surgery and is set to hit free agency in 2019, though the Giants could retain his rights with the franchise tag. The 2015 second-round pick also expressed a desire to remain in New York and is hopeful for an extension, but he didn't give any indication he would consider a holdout if tagged. The 25-year-old would likely be fairly sought after if allowed to reach the open market. Collins (shoulder) underwent surgery Tuesday, and it went off without a hitch. Analysis: Collins will miss the remainder of 2018 because of the shoulder injury, but there's nothing to suggest he won't be ready by the time the 2019 campaign begins firing up. The fourth-year safety could hit free agency this offseason, if he doesn't reach a contract extension with the Giants before then, and would likely be a valued commodity on the open market. Collins (shoulder) is scheduled to undergo surgery in the near future to address a labrum issue and will be placed on injured reserve, Ralph Vacchiano of SportsNet New York reports. The Giants have ruled Collins (shoulder) out for their Week 14 game in Washington and are expected to place him on injured reserve, Josina Anderson of ESPN reports. Coach Pat Shurmur acknowledged Wednesday that Collins will "most likely" require surgery to address his left shoulder injury, Jordan Raanan of ESPN.com reports. Collins (shoulder) is considering season-ending surgery to correct the shoulder injury he sustained during last Sunday's victory over Chicago, SNY's Ralph Vacchiano reports. Analysis: Collins recently underwent X-rays on his left shoulder, and the scans reportedly came back clean. While Collins isn't expected to play in this weekend's game against the Redskins anyway, fantasy owners may need to have a long-term contingency plan in place in case Collins chooses to go under the knife in the near future. The fourth-year pro is slated to become an unrestricted free agent at the end of the league year. Collins (shoulder) is expected to miss Sunday's game against Washington, Ian Rapoport of NFL Network reports. Analysis: We'll look for official confirmation of Collins' Week 14 status in the coming days, but those who normally rely on the safety in IDP formats are advised to line up a replacement. Collins had X-rays on his left shoulder Sunday but the results came back negative, Pat Leonard of the New York Daily News reports. 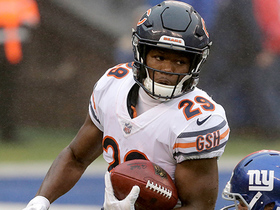 Analysis: Collins exited Sunday's win over the Bears after sustaining the injury, but was able to return and remain in the game. The 25-year-old had played every defensive snap of the season entering Sunday's game -- and although that streak is now broken -- he appears to have avoided a serious injury. Collins recorded nine tackles (eight solo) during Sunday's 25-22 loss to the Eagles. Analysis: Collins has led the Giants' defense in tackles in three straight games, and he now has 91 tackles on the season. The fourth-year pro played 100 percent of New York's defensive snaps Sunday as he has done in every game this season, and he remains a productive IDP starter. Collins notched 11 tackles (five solo) during Sunday's 38-35 win over the Buccaneers. Analysis: Collins continues to lead the Giants' defense in tackles and now has 82 under his belt on the season. The fourth-year pro has been one of the few bright spots on New York's defense this season and is a solid starter in IDP formats. Collins recorded nine tackles (seven solo) across 73 defensive snaps in Monday's win over the 49ers. Analysis: Collins had another productive outing Monday, as he now has 71 tackles on the season -- currently tied for 15th highest total in league. He played in 100 percent of the Giants' defensive snaps, as he has done in every game this season. Collins had eight tackles (seven solo) in Monday's 23-20 loss to the Falcons. Analysis: Collins continues to pace the Giants defense with 57 tackles (40 solo) on the season. The Giants have a Week 8 matchup with the Redskins, who increasingly have relied on RB Adrian Peterson over the last couple weeks. Collins led the Giants with 10 tackles (eight solo) in Thursday's loss to the Eagles. Analysis: Collins has led the defense in tackles each of the last five games, but the team's success continued to be limited by a Giants offense that provided the Eagles a short field twice within the first quarter. The 25-year-old should continue to be one of the top IDP options as the team heads to Atlanta for Week 7. Collins posted a team-high eight tackles (four solo) in Sunday's loss to the Panthers. Analysis: The Giants' secondary managed, for the most part, to keep Cam Newton in check, and while the defensive back was not responsible for either of the two interceptions, he did manage to lead the team in tackles for the second straight week. With New York boasting a shaky run defense this season that's giving up 124.4 yards per game, Collins should continue to have plenty of chances to rack up tackles on running backs advancing to the second level. Collins racked up a team-high 14 tackles (nine solo) and one pass defended in Sunday's loss to the Saints. Analysis: Collins and the rest of the Giants secondary did an effective job against New Orleans' high-octane passing offense, limiting Drew Brees to 217 yards and no touchdowns on 18 completions on 32 attempts. The Saints were more effective in the run game, however, rushing 32 times for 170 yards and three Alvin Kamara touchdowns, leading to high tackle numbers for Collins. 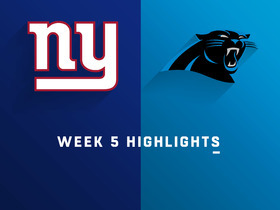 The Giants draw a matchup against the Panthers in Week 5. Collins posted six tackles (five solo) in Sunday's 20-13 loss to the Cowboys. 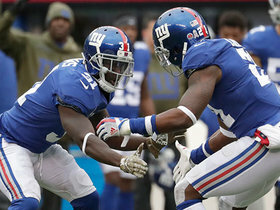 Analysis: Collins finished tied with fellow defensive stars Alec Ogletree and Janoris Jenkins for a team high in tackles, and all three were the only Giants to play every snap on defense. Collins is still considered one of the best safeties in the NFL and is off to a decent start in 2018 with 11 total tackles through the first two weeks. While the Giants aren't moving Collins out of strong safety, he spent a good portion of the game against the Jaguars playing in the box while free safety Curtis Riley patrolled center field in a one-high look, the Newark Star-Ledger reports. Analysis: Collins will be used all over the field and should be one of the top defensive back IDPs if he stays healthy this year. Collins (forearm) believes he's 100 percent healthy, but he also acknowledged that the Giants may want to ease him into action during training camp, Josina Anderson of ESPN reports. Analysis: Collins underwent surgery on his broken forearm in December and had a follow-up procedure in late April, eventually making it back for limited participation in individual drills during OTAs and June minicamp. He doesn't seem to be much danger of missing Week 1, even if the Giants opt for a cautious approach throughout training camp and the preseason. The fourth-year safety is well established as an elite IDP, averaging 7.3 tackles per game for his career. Collins (forearm) sported a regular jersey during individual drills but was held out of team drills at minicamp Tuesday, Dan Duggan of The Athletic New York reports. Analysis: Collins shed his non-contact jersey during portions of OTAs but put it back on when the team took to team drills. He appears to be full go for the start of mandatory minicamp and should resume his duties as a starting safety entering his contract year in 2018. Collins (forearm) shed his non-contact jersey for the early part of Monday's practice, Ralph Vacchiano of SportsNet New York reports. Analysis: Collins ended up putting the non-contact jersey back on for team drills, but noted afterward that he's "on schedule" in his recovery from a fractured right arm and could be fully cleared for next week's minicamp, according to Vacchiano. The Giants could place some restrictions on Collins in minicamp as a precaution, but the star safety shouldn't face any limitations by the time training camp arrives. Collins (forearm) no-contact jersey and worked into individual drills during OTAs on Tuesday, Ryan Dunleavy of NJ.com reports. Analysis: Collins also worked into "seven on seven" drills, which makes coach Pat Shurmur "hopeful" about his return for training camp in mid-July, adds Ralph Vacchiano of SportsNet New York. Despite the Giants' woes in 2017, Collins shined through by posting his third straight 100-tackle season as the team's strong safety. Collins (forearm) hopes to participate in mandatory minicamp starting June 12, SportsNet New York reports. Analysis: Collins has undergone two surgeries since breaking his forearm in late December. The 2015 second-round pick has been a starter since Week 1 of his rookie campaign, accruing three straight seasons with 100-plus tackles. Collins has also broken up 28 passes and posted eight interceptions in that span. Once he's back to full health, the 25-year-old should be a stellar IDP option once again. Collins underwent surgery on his right forearm Monday, Matt Lombardo of NJ.com reports. Analysis: The surgery comes just a month after Collins suggested he was 100 percent healthy. While that doesn't appear to be the case, the expectation is that the Giants' defensive catalyst will only be sidelined 6-8 weeks, meaning he should be fully ready to go for the season opener. The two-time Pro Bowler has a stranglehold over both Michael Thomas and Ryan Murphy at the strong safety spot. Collins confirmed Wednesday that his surgically repaired right forearm isn't healing as hoped, and he indicated that he would require another medical procedure, Art Stapleton of The Bergen Record reports. Collins' surgically repaired forearm isn't healing as doctors had hoped, and the safety could possibly undergo another surgery in the near future, Mike Garafolo of the NFL Network reports. Analysis: It appears Collins jumped the gun Monday when he indicated that he's back to full health. However, even if he does undergo another procedure, the recovery time is expected to be about six-to-eight weeks, which would give him plenty of time to return before training camp starts up this summer. In his potential absence, Michael Thomas and Ryan Murphy should get added reps during spring workouts. Collins indicated Monday that his surgically repaired forearm feels "great" and is now back to 100 percent, Ralph Vacchiano of SportsNet New York reports. Analysis: Collins missed the final game of the 2017 season due to a broken forearm, but the safety is now back to full health and thus poised to remain a top-notch IDP option. The 2015 second-rounder logged 104 tackles and two picks in 15 games last year and seems a sure bet to top the 100-tackle mark once again in 2018, health permitting. The 24-year-old is in the final year of his rookie deal with the Giants and slated to earn $1.27 million. Collins (forearm), who was placed on injured reserve Monday, underwent surgery earlier in the day, Paul Schwartz of the New York Post reports. The Giants placed Collins (forearm) on injured reserve Tuesday, Michael Eisen of the Giants' official site reports. Analysis: Collins' move to IR was merely a formality after he fractured his right forearm in Sunday's 23-0 loss to the Cardinals. With Collins unavailable for the season finale against the Redskins, the Giants elected to fill his spot on the 53-man roster with linebacker Derrick Mathews, who was promoted from the practice squad. Collins finishes his third NFL season with 104 tackles, six pass breakups, two interceptions and two fumble recoveries across 15 contests. 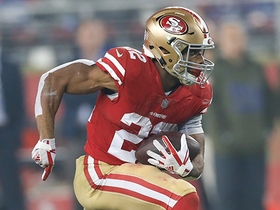 Collins suffered a broken forearm during Sunday's game against Arizona and will miss the Giants' Week 17 game against Washington, New York Post writer Paul Schwartz reports. Analysis: Collins' injury is a painful one that will require some recovery time, but his availability beyond Week 17's meaningless Giants finale is fully assured. The timing was relatively fortunate in that sense, uncomfortable as Collins will be in the meantime. Collins suffered a forearm injury during Sunday's game against Arizona and has been ruled out for the remainder of the contest, Art Stapleton of The Bergen Record reports. Analysis: Collins' injury appears to be severe enough to keep him out of Sunday's game, but it remains to be seen whether he'll play in Week 17. For now, Nat Berhe figures to slide into the open starting safety spot. Collins (ankle) is listed as active for Sunday's game against the Cardinals. Analysis: Collins was only able to see action on 18 of the Giants' 67 snaps on defense in Week 15, tallying just one tackle in the process, but he'll tough it out again Sunday after logging a limited practice Friday. When healthy enough to play his full allotment of snaps, Collins has been IDP gold. Overall, the Giants' strong safety has racked up 103 tackles and two picks in 14 games. Collins (ankle) was a limited practice participant Friday and is listed as questinoable for Sunday's game in Arizona. Giants interim head coach Steve Spagnuolo said Collins (ankle) is "hopeful" that he'll play Sunday at Arizona, but the team will "be careful" with its starting strong safety, Ralph Vacchiano of SportsNet New York reports. Analysis: Collins brushed off a doubtful designation to take the field Week 15 against the Eagles, only to depart in the first half after aggravating his left ankle injury. His lack of practice reps Wednesday shouldn't be cause for concern yet, as he kicked off last week's game preparation in the same manner. Nevertheless, Collins will likely have to prove he's healthier this week than last in order to be cleared by team trainers. Collins (ankle) will not return to Sunday's division game against the Cowboys, Paul Schwartz of the New York Post reports. Analysis: Collins was listed as doubtful to play but proved himself enough pregame to earn the green light. The 24-year-old exited earlier in the first half to have his ankle re-taped, according to Art Stapleton of The Bergen Record, before ultimately being ruled out. Andrew Adams is his likely replacement at strong safety, but Ryan Murphy could also see some snaps with Collins sidelined. Collins (ankle) is active for Sunday's contest versus the Eagles. 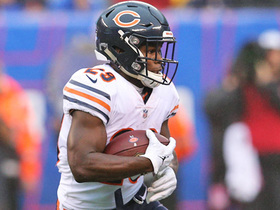 Analysis: Rarely does a player enter the weekend with a doubtful designation and actually achieve active status, but Collins did just that Week 15. The final call was seemingly made by the team's training staff, who took in his pregame workout Sunday, according to Art Stapleton of The Bergen Record. Collins will thus avoid the first DNP of his career as he looks to build upon his 102-tackle campaign. Collins (ankle) is listed as doubtful for Sunday's game against the Eagles, Jordan Raanan of ESPN.com reports. Analysis: With Nat Berhe (hamstring) already ruled out, Andrew Adams likely will get the start at strong safety. It's a major downgrade for the Giants' struggling secondary and a big loss for anyone counting on Collins for the fantasy playoffs in IDP leagues. The third-year safety is the only non-linebacker with triple-digit tackles for the season heading into Week 15. Collins (ankle) was a limited practice participant Thursday, Jordan Raanan of ESPN.com reports. Analysis: After the session, head coach Steve Spagnuolo noted Collins took part in individual drills, which was a step up from Wednesday's lack of activity. Despite that DNP, Collins spoke about his health afterward. "It's sore, but other than that, I'm going to be able to play on Sunday," Collins told Michael Eisen of the Giants' official site. Collins has never missed a game in nearly three seasons as a pro, so the progress made so far this week has him trending in a positive direction. Collins (ankle) won't participate in practice Wednesday, Paul Schwartz of the New York Post reports. Collins has a boot on his left ankle after Sunday's game against the Cowboys and said it's a mild sprain, Kimberly Jones of NFL Network reports. Analysis: This is the same ankle that he suffered a high-ankle sprain to earlier in the season, but Collins sounds optimistic about his health going forward. The young stud surpassed 100 tackles for the third time in his career in as many years, so having him ready for Week 15's game against the Eagles would be useful. If he can't go, expect Nat Berhe and Andrew Adams to see increases in their defensive snap counts. Collins injured his ankle during Sunday's game against the Cowboys and is questionable to return, Jordan Raanan of ESPN.com reports. Analysis: Collins has seven tackles (six solo) before leaving Sunday's game in the fourth quarter. The third-year pro has been lights out this season, compiling 95 tackles, six pass breakups and two interceptions through 12 games. If this injury is deemed serious, Collins could miss the first game of his career. For the time being, expect Nat Berhe and Andrew Adams to rotate in. Collins recorded nine tackles (seven solo), one pass defensed and recovered a fumble in Sunday's loss to the Raiders. 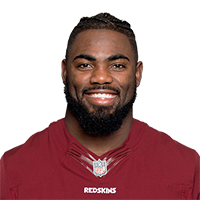 Collins made 15 tackles (13 solo) against the Redskins on Thursday. Analysis: Collins now has 30 tackles, one pass breakup and one interception in the last two games. Some of this is due to the absences of linebackers B.J. Goodson (ankle) and Calvin Munson (quadriceps) but Collins has been strong his whole career, beginning with back-to-back 100-tackle seasons. Goodson and Munson could both return in Week 13, but Collins is still a solid play going forward. Collins had an absolutely monster game with 10 solo tackles, four assists, a defensed pass and an interception against the Chiefs Sunday. Analysis: Collins was last year's top IDP among defensive backs, but had battled through injuries and fallen behind that lofty pace. After Week 11, we have to assume he's completely healthy and a decent bet to deliver big down the stretch. The New York Giants defense stop Tampa Bay Buccaneers quarterback Ryan Fitzpatrick on a 4th-and-1 attempt in the red zone. 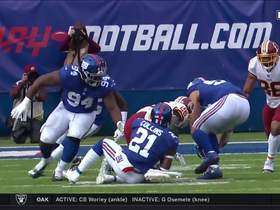 New York Giants safety Landon Collins swarms the backfield for a 6-yard loss. 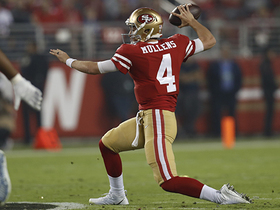 San Francisco 49ers quarterback Nick Mullens lasers pass to Matt Breida for 19 yards. San Francisco 49ers Nick Mullens is nearly picked off on pass to tight end George Kittle. 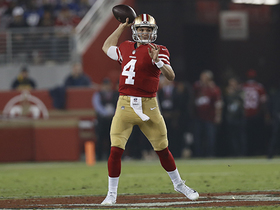 San Francisco 49ers quarterback Nick Mullens slings first-down pass from his knees. New York Giants safety Olivier Vernon strips the ball from Washington Redskins wide receiver Adrian Peterson, and Giants linebacker Olivier Vernon recovers and returns it back 43 yards.